The biceps muscle is interesting anatomically. It has 2 tendons at the top which anchor the muscle around the shoulder and it has one tendon at the bottom which attaches just beyond the elbow in the radial tuberosity. Its function around the shoulder is unclear however at the elbow end it has 2 actions; it helps with bending the elbow (flexion), although other muscles are actually much more powerful, and it twists the forearm to turn the palm upwards (supination). As we were taught at medical school it screws the corkscrew into the wine bottle (supination) then pulls the cork out (elbow flexion). The 2 tendons around the shoulder are called the long head of biceps (LHB) and the short head of biceps. LHB is prone to injury and tearing – see below. At the elbow end the tendon can also tear but it is less common – see below. LHB is a long thin tendon which has not been well designed! It runs up from the muscle belly, through a pulley, and then attaches deep inside the shoulder joint where it blends with the labrum. If LHB is injured it can pull the labrum away from its attachment at the top of the socket (glenoid). This is called a SLAP tear (superior labrum anterior and posterior). Minor detachments (type 1) are a common, age related degenerative process and do not warrant surgical intervention. Types 2 and beyond are typically, in the UK, associated with a shoulder dislocation in young adults. These SLAP tears are typically diagnosed by MRI and can be treated with arthroscopic (keyhole) surgery (find the post-operative physiotherapy programme here). However it is a very over-diagnosed problem and the treatment is prone to causing intense stiffness of the shoulder joint. Sometimes the pulley becomes weakened or torn and this allows the LHB to move around abnormally in the shoulder joint. This is painful. Normally this happens in association with a tear of part of the rotator cuff (specifically the subscapularis) tendon. It can be diagnosed by ultrasound or MRI and usually requires surgical treatment of the subscapularis tear. LHB can rupture (tear). When this happens the muscle belly drops towards the elbow creating the characteristic “pop eye” sign. This is a cosmetic issue for some people but it does not seem to be associated with any functional problems. Once things settle down there is a permanent pop-eye sign but no on-going pain or weakness. Presumably because the short head remains firmly attached and therefore the muscle still has a strong anchor point. LHB ruptures are most commonly seen in the older population and usually occur in conjunction with a rotator cuff tear. In some middle aged people the tendon tears in isolation and the rotator cuff seems fine. Occasionally we encounter LHB ruptures in steroid abusing weight lifters. This can be difficult to treat. 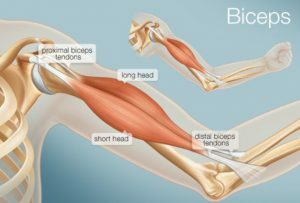 The far end (distal) of the biceps tendon, where it attaches into the forearm, can become inflamed (biceps tendonitis) or even ruptured. This is most commonly seen in middle aged men who are either engaged in heavy manual work or who enjoy spending time in the gym. It causes a sharp pain in the front of the elbow during resisted elbow curls. It can be difficult to diagnose but an MRI is usually the most effective investigation. Treatment consists of rest, activity modification, anti-inflammatory tablets and physiotherapy. If this fails to settle the pain then an ultrasound guided cortisone injection can be very effective. It is rare to need surgery for this problem. Unfortunately this diagnosis is often missed or diagnosed late. It is most common in middle aged men. It tends to occur when bending the elbow up hard at the same time that it gets yanked out straight. For example on the rugby pitch when trying to pull down an opponent who manages to break through the tackle. Normally a snap will have been felt and there is immediate pain around the elbow. Some days later bruising appears on the inside of the upper forearm. Often the strength of elbow flexion is maintained because other strong muscles also perform this action. However the power of keeping the hand palm up against resistance is hugely reduced. 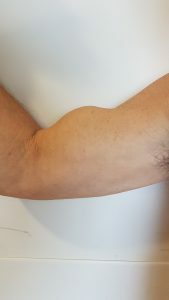 Some people choose to live with the tendon rupture and accept it for what it is: a change in shape of the biceps muscle, good elbow flexion strength but weakened supination. But most people prefer to have an operation to repair the tear once they know it cannot heal itself. 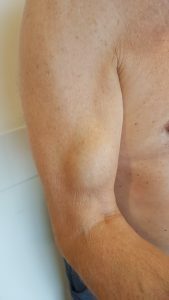 The diagnosis of a distal biceps tendon rupture can be confidently made by an experienced clinician. Otherwise an urgent ultrasound or MRI is required. The speed of diagnosis is critical because it is a fiddly operation that is best and most safely performed within 6 weeks of the injury. The operation involves re-attaching the torn tendon to bone usually with 2 bone anchors. Then 2 weeks in plaster followed by 4 weeks of gentle mobilisation. The next 6 weeks are spent gradually strengthening the tendon so that by 3 months after surgery you should have full movement and near normal strength. Harry has performed 62 distal biceps tendon re-attachments. Postoperative physiotherapy protocol for distal biceps tendon repair can be found here. Contact us for enquiries today.